In 1996, Southern Peru Copper Corporation (SPCC) installed real-time meteorological monitoring stations at its various operating locations (Ilo Copper Smelter, Ilo Copper Refinery, Cuajone Copper Mine, and Toquepala Copper Mine). This network of 17 weather stations was set up to measure meteorological conditions and air-quality levels to fulfill Peruvian environmental laws, and to collect data for air-dispersion models and other studies. TRC Environmental installed the stations and trained SPCC staff members to verify and calibrate all sensors according to US EPA requirements. In 2007, Enviroequip upgraded the weather-station dataloggers to the Campbell Scientific CR1000. Marco Mena and Hernán Dávila of SPCC maintain and manage the system. The Cuajone meteorological and air-quality station is located at the Villa Botiflaca Camp (12,000 ft above sea level). This station has collected about 13 years of valid data. The data are collected and stored as 5-min averages computed from 1-s values using a Campbell Scientific CR1000 datalogger. Campbell Scientific's datalogger software is used for data retrieval, real-time display of numeric values, and datalogger program modifications. 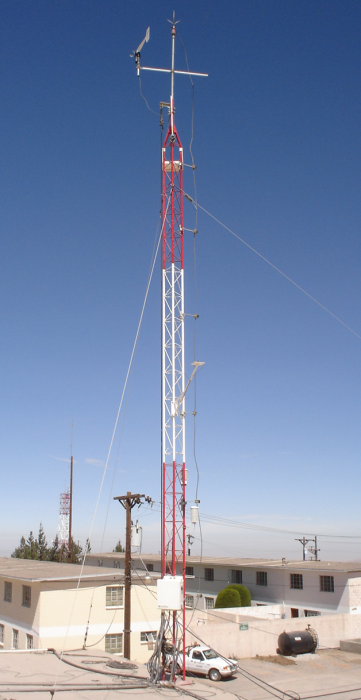 Meteorological sensors are mounted on 10-m towers. Operators climb the towers for monthly verification, calibration, maintenance, and audits. The tower sensor configuration includes wind sensors, temperature probes, relative-humidity sensors, solar radiation sensors, barometric pressure sensors, and tipping-bucket rain gauges. All the data and plots can be checked by meteorologists in the control center in order to examine any irregularities in the data and decide if some corrective action is needed. For air-quality monitoring, they use PM10 and PM2.5 monitors connected to Campbell Scientific CR1000 dataloggers. With the updated dataloggers, the network should provide many more years of valuable data.